A Thousand Views of the Sea and Waterside - Hokusai's striking series "A Thousand Views of the Sea and Waterside" is considered one of the great landscape series from the later part of his career. Focusing on fishing and the movement of water, Hokusai's images beautifully capture mesmerizing scenes on the ocean, at the beaches, and along the rivers of Edo era Japan. 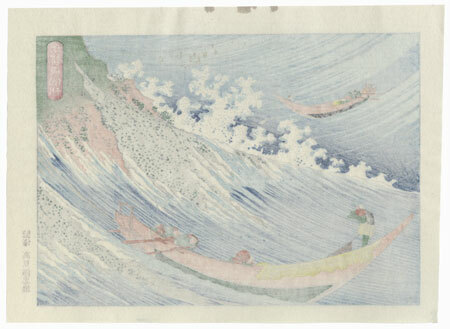 Today collectors prize these beautiful old reprints from the "Sea and Waterside" as they are rarely seen in the market compared to Hokusai's more famous "Thirty-six Views of Fuji" series. If these wonderful views appeal to you, bid now! Hokusai Anthology of Famous Pictures by Takamizawa - In the mid-1950s, the renowned Takamizawa Publisher released a reprint series of 49 of Hokusai prints. 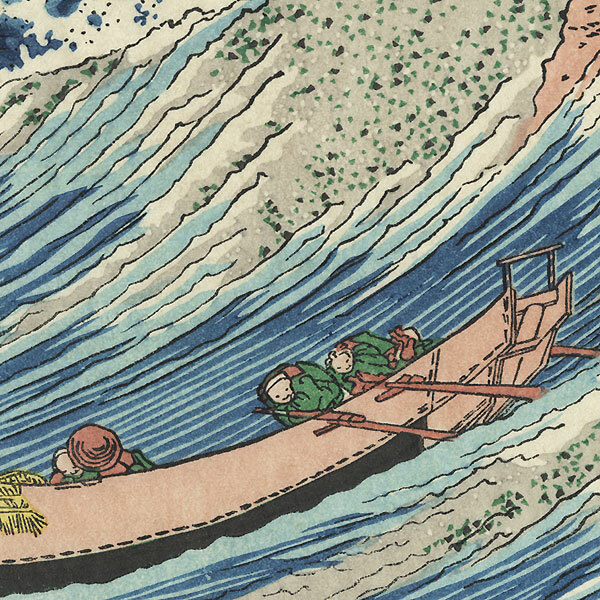 The series focused on Hokusai’s charming, atypical designs that were less commonly seen. From nature scenes and beauties to outstanding selections from Hokusai's "100 Views of Mt. Fuji" series, these expertly carved and printed designs beautifully capture the details of the Edo era originals. Printed with the attention to detail and exquisite quality of the Takamizawa Publisher, this rare reprint series is a collector’s delight. 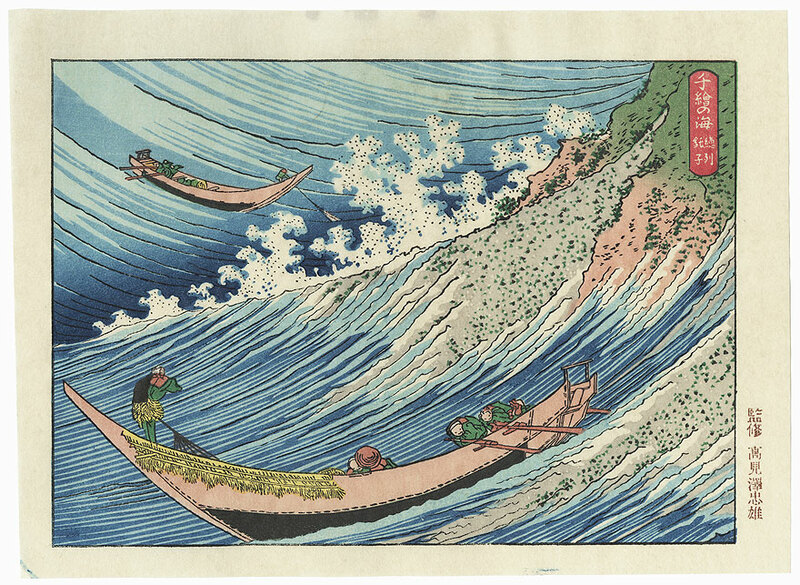 Choshi in Shimosa Province - This is considered the most outstanding print of the series. Hokusai depicts the force of the raging waves breaking on the rocks at Choshi. The motion of the water against the rocks and boats tossing on the waves is reminiscent of his masterwork, "The Great Wave." A terrific design. Condition - This print with excellent color and detail as shown. Slight paper remnants on reverse at top center from original publisher mounting. Please see photos for details. Nice overall.